So with the OnePlus Two released to the public we now know most of the decisions that went into the making of the OnePlus Two. One of the interesting changes from the previous model is that the NFC chip was removed. If you’re not familiar with NFC then it’s a technology which allows the phone to communicate with other NFC-capable devices by holding the devices together. As an example – mobile payment systems often use NFC. As a technology, NFC is only just starting to reach the mainstream market and most people will tell you they haven’t ever used it before or don’t even know what it is. The decision to remove NFC was made in the last few weeks while I was still working at OnePlus and there was definitely a mixed internal reception to the news. I never got the actual reason for the removal, though, so the following is mostly speculation and analysis – not inside information. With that out of the way, lets look at the logic that might explain why OnePlus removed the NFC chip from the OnePlus Two. The most obvious reason is to cut costs. The quoted savings by implementing NFC ends up at around $5 per phone depending on volume. In the end that’s a $5 more attractive price and might result in more sales than the marketing value of having NFC. So the big question is: Is the biggest segment of OnePlus users people who use NFC or not? While I doubt even OnePlus knows for sure it certainly seems as if they think most people won’t care. 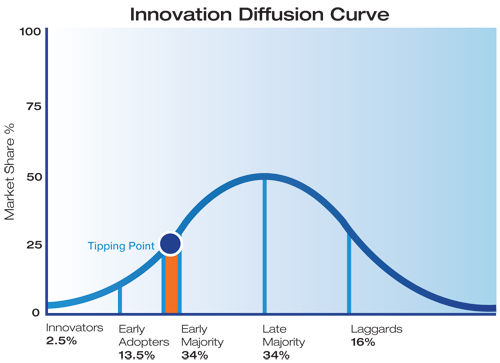 If we reference the famous innovation diffusion curve the question becomes: Has OnePlus reached enough of the majority market to not need the early adopters any more? This is the part that’s deceptively difficult to answer, if you look at the initial response then you might be inclined to say no. Reddit, Hacker News (though the post strangely disappeared from their front page) and tech media are the first ones to voice their opinion and these are definitely the innovators and early adopters who use these technologies. However, if you look at the media attention that the OnePlus One received (hats off to Bridget Hickey for that excellent work) then you see a lot of maintream media such as Time.com, Wall Street Journal et al. For the OnePlus Two we already see that media which borders between early adopters and early majority such as Wired has already talked about the OnePlus Two. If I were to make a guess I’d say that yes, I think OnePlus has probably passed the tipping point of where NFC makes sense and the slightly lower price will benefit more than having NFC as a feature. My primary concern with this decision is what happens to those users who buy the OnePlus Two unaware of the lack of NFC and later on find that their phone cannot use a brand new mobile pay system or their cool garage project isn’t going to work. The negative impressions that those users receive might follow OnePlus for a while. Ultimately all research shows people who make predictions are usually just blowing hot air so I’m not going to say whether this decision was good or bad. I know for a fact that OnePlus management aren’t stupid and understand their market very well, that said, everyone sometimes misreads things and when you’re dealing with most of the world as your market it’s difficult to fully understand how a technology such as NFC applies everywhere.